Lemax Trash Bandits Figurines depicts a group of mischievous Raccoons working as a team to find food amongst the rubbish bins. A delightful Lemax scene figurine piece which joined the Lemax collection in 2004. 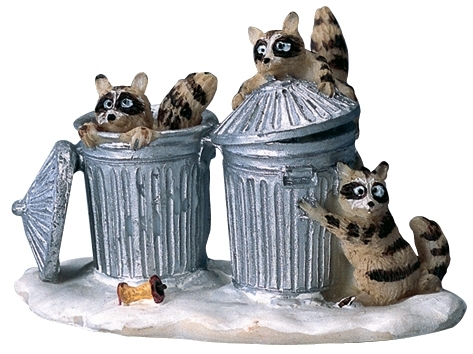 Trash Bandits represents a group of individual hand painted polyresin figures mounted on a single snowed street base to compliment your seasonal Lemax Village display.